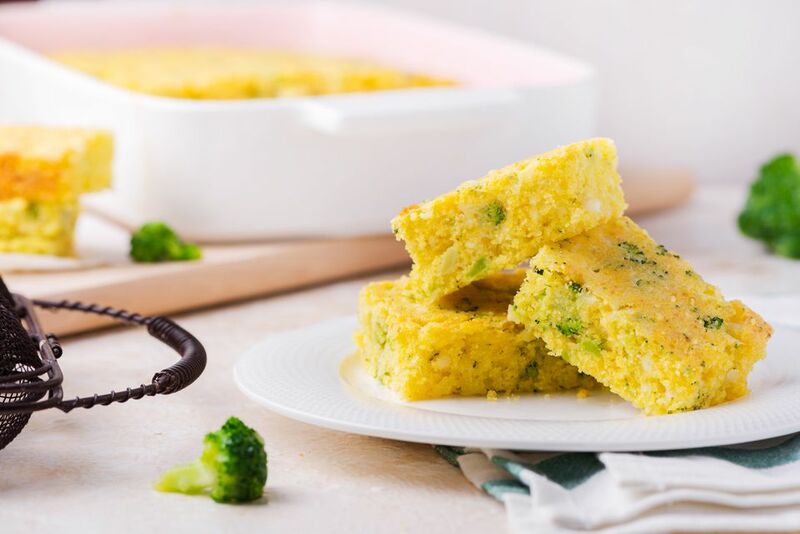 Broccoli and cottage cheese make this cornbread super moist, delicious, and nutritious. This recipe is the Mississippi version of the popular broccoli cornbread. It's easy to make with a Jiffy corn muffin mix. It's an excellent bread to take along to a potluck or for a tailgating event. It goes well with beans, chili, and greens. Add some cheddar or Monterey Jack cheese to the broccoli cornbread if you like. Heat the oven to 375 F (190 C/Gas 5). Grease a 9-by-13-by-2-inch baking pan. Combine the corn muffin mixes in a bowl with the beaten eggs and melted butter. Mix well. Stir in the drained broccoli, chopped onion, and cottage cheese. Bake in the preheated oven for 35 to 40 minutes, or until lightly browned. Add 1 cup of cheddar or Monterey Jack cheese to the cornbread and sprinkle extra shredded cheese over the top before it goes into the oven. Use fresh broccoli. Steam about 1 1/2 to 2 cups of chopped broccoli or small florets in a small amount of water for about 4 to 5 minutes, or until just tender. Let the broccoli cool and then add it to the batter. Add 1/4 to 1/2 teaspoon of onion powder for a more pronounced onion flavor. Chopped green onions may be added as well. Bake the batter in muffin cups for about 18 to 22 minutes, or until golden brown.